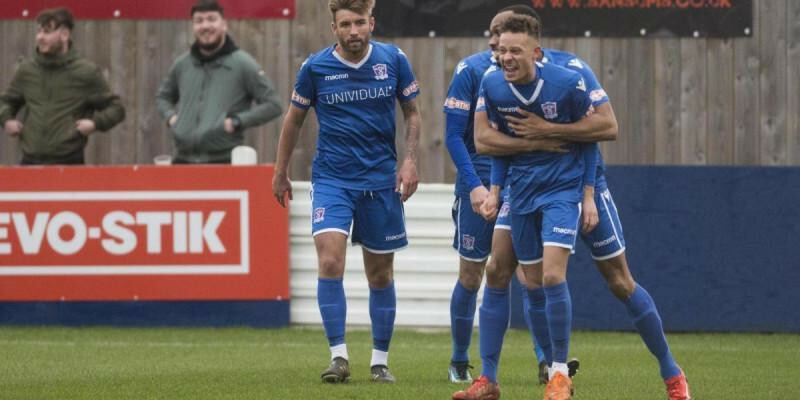 Swindon Supermarine provided the perfect response to last weekend’s disappointing defeat away to Basingstoke Town by comfortably brushing aside Beaconsfield Town at The Webbswood Stadium Saturday afternoon. Ryan Campbell returned to the side in place of Joe Selman whilst new signing from Gloucester City, Striker Harry Williams had to make do with just a spot on the bench. Josh Hill also made a very welcome return to the team after being injured since the FA Cup draw away at Chippenham Town in September. It wouldn’t be long for the returning Campbell to make an impression on the game when he excellently finished Henry Spalding’s cross, firing home with the outside of his boot from 18-yards into the near corner after only 14 minutes. Stuart Fleetwood then went close as he forced Charlie Burns into a good save following some fine build-up from Jamie Edge and Conor McDonagh. Campbell had the ball in the net again four minutes after his first when he pounced on a partly cleared defensive header, taking a touch with his chest and as the ball sat up perfectly, he unleashed a fine right footed volley into the far corner with Burns able to only stand and watch the ball hit the back of the net. With the howling wind at their back, Fleetwood was off target with an effort from distance ahead of Campbell firing straight and high at Burns from the edge of the box. Beaconsfield may count themselves unlucky when Brendan Matthew appeared to be hauled back in the box, but the referee turned away the visitors protests, waving play on. Calvin Dinsley (pictured above) was unlucky to not score his first goal for the club when he just failed to get on the end of McDonagh’s cross shortly before half time. Supermarine continued to impose their excellent brand of football on the Rams and only three minutes into the second half made it 3-0 when a fine flowing move between Campbell and Fleetwood sent McDonagh (pictured below) in on goal and from the tightest of angles he somehow squeezed the ball through the visiting keepers legs. With 17 minutes remaining Manager Lee Spalding sent on Harry Williams for his Supermarine debut and it wouldn’t take long for him to also make his mark on the game. The pacey forward looks to offer Spalding something a little different for the remainder of the season and it was his pace that provided the assist for the fourth goal when he was played in down the right hand side and as he approached Burns he took a couple of touches and as both the covering defender and keeper committed to the ground he calmly squared the ball across to Fleetwood who took a touch to steady himself before rolling the ball into the net. It was almost five when Spalding was the benefactor of more excellent fast flowing Marine football with excellent build-up interplay between substitute Brad Hooper, who was making his 150th appearance for the club and Dan Williamson but his finish was just too high and over the bar. Spalding rejected claims that his side had not been at the races in recent weeks, instead saying: “Performances during their winless run ‘had’ been of the required standard and it was simply the scoreline that did not go their way. The Marine chief felt his side responded in the perfect way and is looking forward to where he can take them next season”.